Light moves around us, in a second being reflected, a next moment restricted or escaping through a rhythm of objects, Light gives the motion to what we create. A motion with a ceramic material that shapes the function in its balance and position. The element of lightness is present to the function that ceramics takes over in shaping the position and having weight in the stability factor to adjust position. Creating the repose of the light. A series of ceramic lights that plays with a changeable motion of light beams. Shaping the ceramic compartments into various stills and positions to direct the light bundle into the right direction. 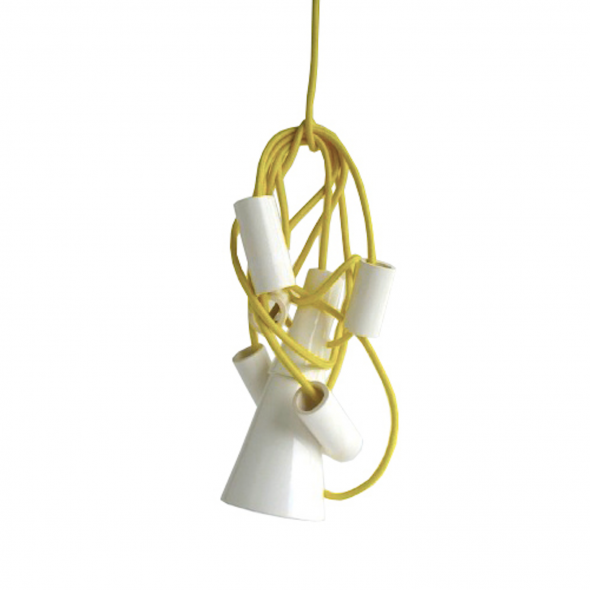 Reposed Light contains out of a series of 8 ceramic compartments that hold the 7m fabric knitted cord. The compartments combine into a chain that through the weight of the material are ﬂexible and steady to shape. The material makes it available to bundle the cord together on the wall, pendant or table. The compartments are possible to stack or bundle together to guide and give a base for the lightbulb itself. For sales information please email us.